Grass is for cows ……….. !!! In 2011, at Wimbledon, the new world No 1 plucked a handful of Centre Court’s hallowed blades to eat at the end of what he described as the best game of his career, which was described as a practice best left to sheep and cows, according to Sue Baic, spokeswoman for the British Dietetic Association. That time Tennis star Novak Djokovic's unusual grass-eating celebration proved a gift to headline writers a day after he was crowned Wimbledon champion, but raised eyebrows elsewhere. Djokovic sank to his knees and nibbled a piece of the Center Court lawn on Sunday after beating Rafael Nadal to win the men's singles title, later saying: "I felt like an animal. I wanted to see how it tastes." The man now in news sinking to his feet, began playing tennis at age five...Nicknamed "Dreddy" because of his dreadlocked hair...Speaks German, English and Jamaican...Born in Germany, lived there until August 1996, when he moved to Jamaica to begin his pro career...In October 2010, changed his nationality to Germany...His father, Leroy, is Jamaican and his mother, Inge, is German…....Favourite surface is grass and considers serve and forehand his best shots...Idol growing up was Marat Safin... not many would identify him even with this lengthy description, nor with the photo even….. The Halle Open, currently sponsored by Gerry Weber and called the Gerry Weber Open, is a tennis tournament held in Halle, North Rhine-Westphalia, Germany. Held since 1993, the tournament is played on four outdoor grass courtsand is a part of the ATP World Tour 250 series on the ATP Tour schedule. The Centre Court (the Gerry Weber Stadion) has 12,300 seats and a retractable roof which can be closed in 88 seconds so that tennis games can continue with a closed roof when it begins to rain. The Gerry Weber Open is one of five grass court events on the ATP World Tour calendar, and gives players their first chance to play on the surface in the lead-up to Wimbledon. The Gerry Weber Open has crowned five German winners since the inaugural event in 1993: Michael Stich (1994), Nicolas Kiefer (1999), David Prinosil (2000), Tommy Haas (2009 & 2012) and Philipp Kohlschreiber (2011). Roger Federer won his sixth title in 2013. Rafael Nadal had good reason to call German Dustin Brown“very dangerous” ahead of his 2014 grass-court opener in Halle. Four days after winning a record ninth Roland Garros title, the World No. 1 fell 6-4, 6-1 to an inspired Brown in the second round of the Gerry Weber Open. The Mallorcan had been bidding for his 700th match win. "I lost today because my rival was playing better than me," said the 28 year old. "And at the same time, as I said yesterday, the transition from clay to grass is difficult, especially when you arrive a little bit tired and not at 100 per cent. But I tried my best." Nadal, playing his first grass-court match since a first-round upset last year at Wimbledon, dropped the opening set with an unforced error, after having saved triple set point. Brown raced out to a 5-0 lead in the second before Nadal finally held to force the German to close out the match on serve. 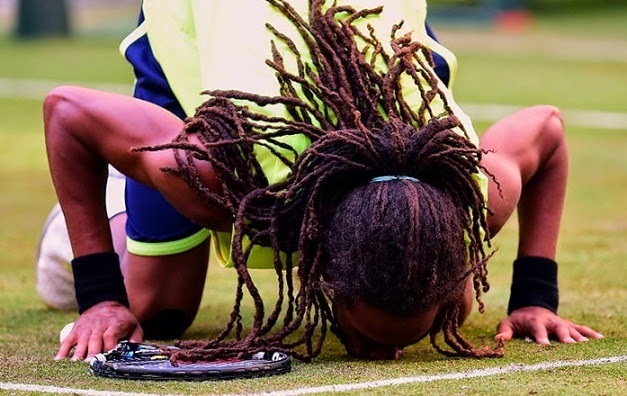 In John Wayne style, Dustin Brown, the dreadlocked destroyer, shot down the overwhelming favourite Rafael Nadal. Brown fought with every ball as if it was on a mission to destroy him. The balls survived, his opponent didn't. After 59 minutes, the pulse was broken. Brown kissed the court. "I love grass!" he proclaimed before unveiling the secrets to his tactical masterclass. "It was something I'd discussed with my coach, even if many people probably thought I was crazy. The World No. 85 recorded his second win over a Top 10 player. This past April, he upset top seed and defending champion John Isner en route to the quarter-finals the US Men’s Clay Court Championship in Houston. Nadal, a two-time Wimbledon champion, dropped to a 1-3 record at this ATP World Tour 250 grass-court tournament. All three of his losses have come against German players. When Ivan Lendl missed Wimbledon in 1982, he uttered what has since become a cliché: "Grass is for the cows."